He will always make an exception for this dish and whenever I roast them. Plain green beans drizzled in olive oil, sprinkled with salt, pepper and a little crushed garlic then roasted for a few minutes in the oven–much like the way I prepare asparagus–have changed his tune. His dislike has turned into appreciation but I knew that brussels sprouts were in no danger of being ousted from their top spot as his favorite vegetable. 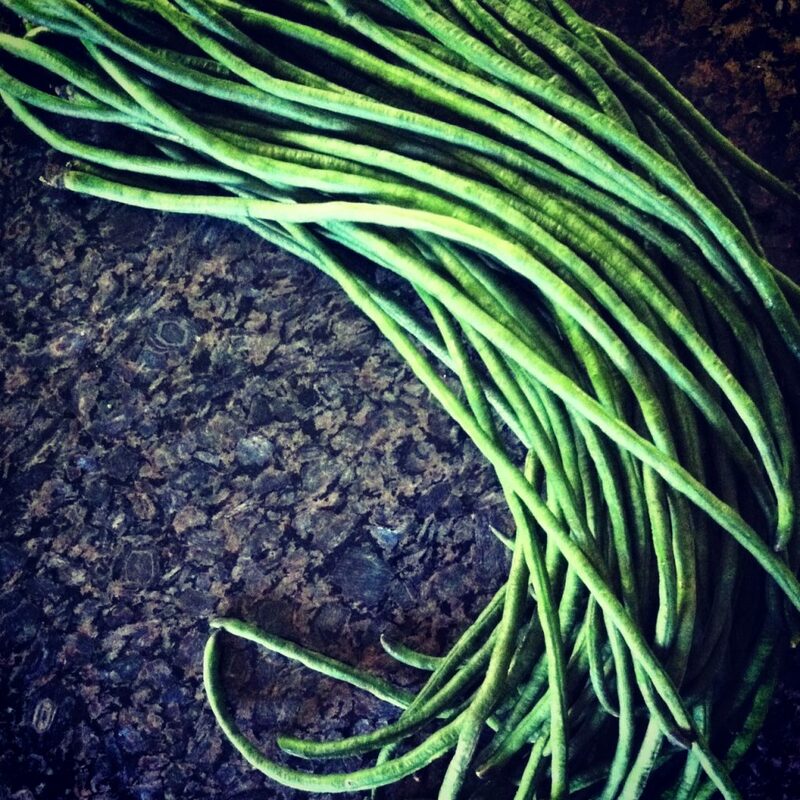 When I spotted string beans at the market a couple of weeks ago I put them in my cart without a second thought. It had been far too long since I last had them and I knew I had one or two of our default vegetables at home–making two separate dishes one night wasn’t going to be much trouble. I stir-fried just enough for one, looking forward to tasting the natural sweetness of the string beans enhanced by ginger and my homemade chili sauce. If you’ve not tried them before, string beans, though thinner, have more of a bite than regular green beans; I also think they are more flavorful. They are ideal for stir-fries because they can stand up against high heat and don’t go limp very easily. I had a bowl of rice ready to be topped with my stir-fry but guess who ended up eating it? He said the aroma of the ginger, garlic and chili paste led him to the kitchen. He stole a bite as I spooned the beans onto my bowl and being a complete sucker for his murmurs of appreciation, I found myself offering him my dinner instead. I had the brussels sprouts that night but it’s okay. He is now a string bean convert and I’ve made this same dish three more times since—for two, of course. 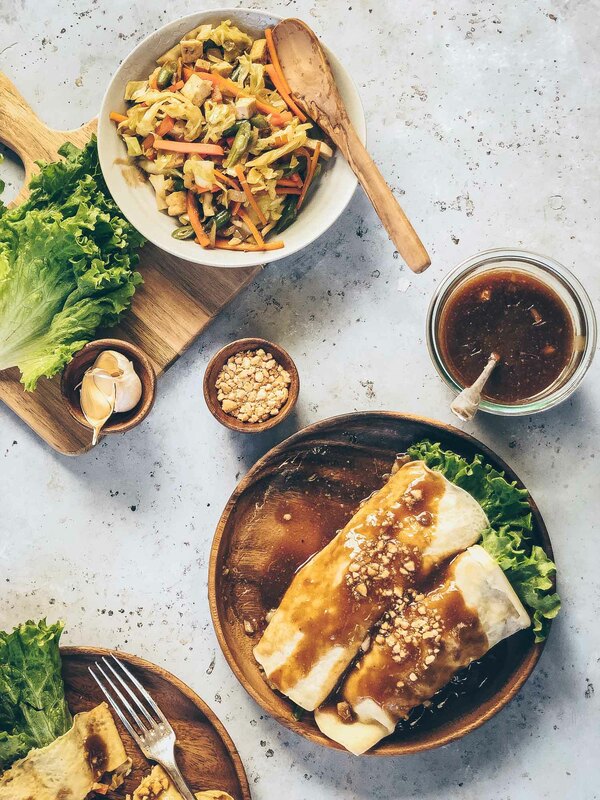 * Because of the small amount of vegetarian “oyster” sauce added to this dish, it allows for the ginger, garlic and chili sauce to caramelize, adding lots of depth for a dish that takes so little time to cook. Don’t be afraid of the pan turning them into brown bits. Just add water or stock to deglaze. This is where all the flavor is. 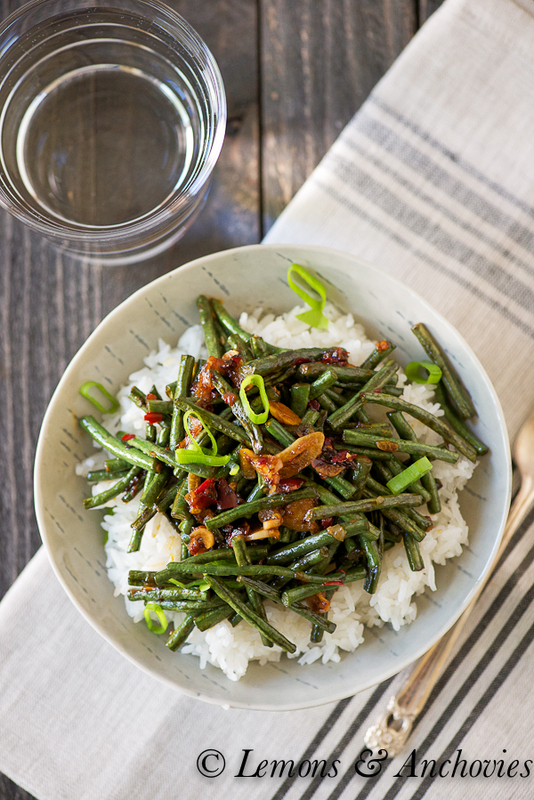 Feel free to use regular green beans in this recipe but if you have access to Chinese long beans, give them a try. Heat the oil in a pan over medium-high heat. Add the grated ginger, garlic and chili paste and cook until fragrant, about 2 minutes. Don't let the garlic burn. Add the string beans to the pan, turn up the heat to high and also add the oyster sauce. Stir-fry for 3-5 minutes, until the beans are crisp-tender and slightly charred. You can also add a splash of water or stock to the pan then cover it to let the beans cook a bit faster. You just don't want the garlic and ginger to brown too fast but expect to see some caramelization while the beans cook--this will lend a lot of flavor. If you do see some premature browning, deglaze the pan with a bit of water and/or lower the heat. Serve over steamed rice. This is such a pretty, Spring dish! 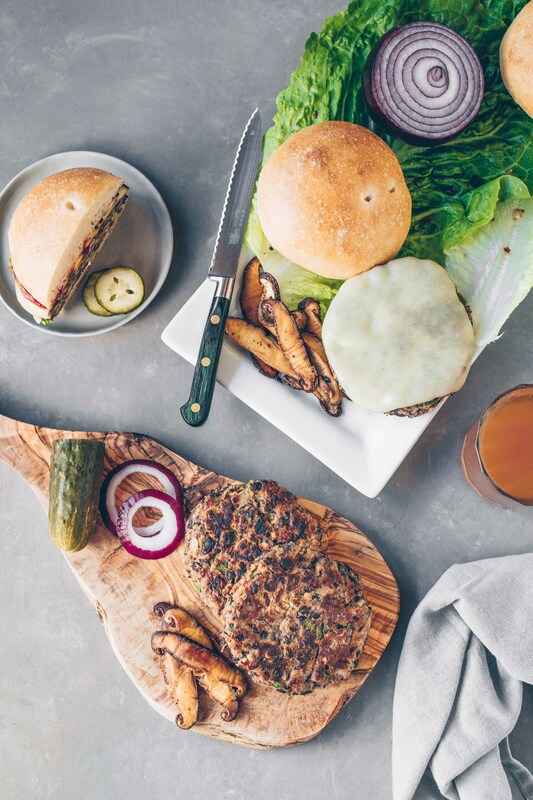 Love easy recipes for weeknights! This is beautiful and perfect for a weeknight meal. I always have to add meat for the hubby but this would be enough for me!! These would be welcomed at our dinner table anytime. Congrats on turning your husband onto the joys of string beans! 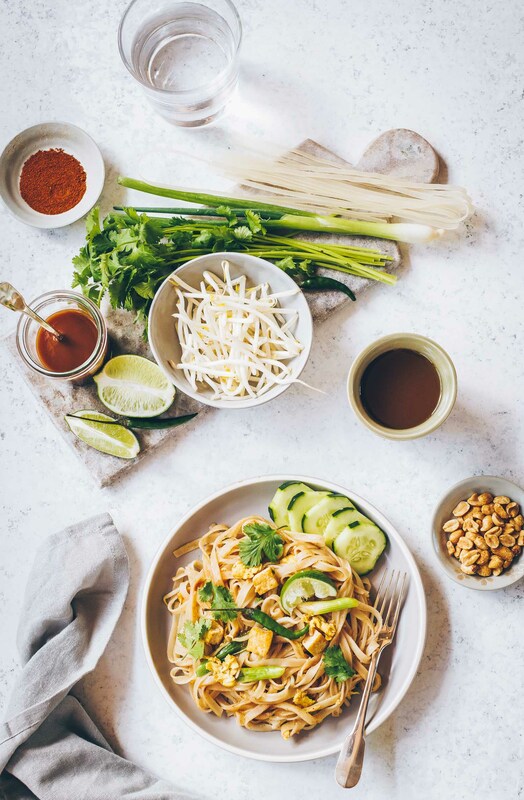 🙂 This dish is beautiful (and healthy!). You have me craving a trip to the farmers’s market. A scrumptious dish! 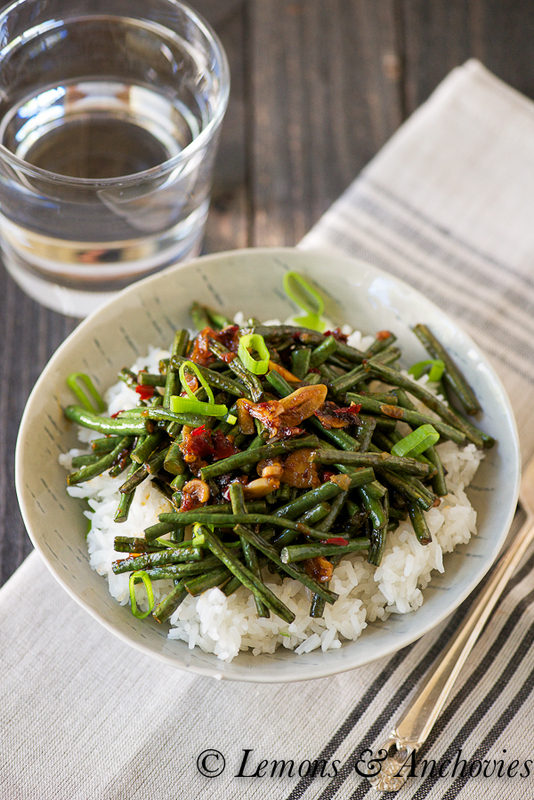 String beans are perfect for making stir-fries. Oh yum! I love me some string beans, your flavors would be amazing! I want this for dinner tonight! It looks amazing! I can’t wait for our farmer’s market to open…this will be on my list! I love stir-fried string beans! These look wonderful. This looks yummy and comforting.. I saw Chinese long beans at the local farmer’s market recently and so wanted to give them a try but wasn’t sure what to do with them. I love the idea of using them in a stir-fry as you have done here. Looks delicious! I forgot if I told you (maybe I did?) but your Sichuan Green Beans is my favorite green bean recipe!!! I made probably over 15 times… 😀 I can’t wait to try this!! Perfect shot right there! I didn’t know that–so nice to hear! We really like it around here, too. Never lasts long when I make it. So glad you tried it, Nami! Oh my, who else could make string beans looks so beautiful …………… and so….. delicious!!!? Now I am craving green beans and that is a very good thing! Jean – I am loving this dish! I have never bought the Chinese long beans but always have wanted to try them. When I do, I am making it with your recipe! I love green beans, but the rest of my family doesn’t. I have never actually had string beans before. Stir fries are always a hit here, so I might need to search them out and try this recipe! Looks gorgeous! I’m happy that you can get your husband to eat green beans. Now can you get me to? 😀 I find that they’re too flavorful. I just don’t like them. But I occasionally make them for my husband and next time I do, I’ll keep these in mind! A great combination of ingredients, Jean! Yes, we did try these beans. My kids said they looked like long, green snakes! They are chewier than American or French green beans, but I still loved them. Of all the veggie stir-fry dishes out there, this is the hubby’s favourite! Which reminds me, I should cook more of this for him. He will be so happy! This recipe sounds delicious but I’m not familiar with vegetarian oyster sauce. Where can I purchase it? Hi, Renee. Vegetarian Oyster sauce is made with mushrooms and I buy it from my local Asian market. It’s always right next to the traditional oyster sauce. I just checked and it’s also available on Amazon though a little pricier. Hope this helps!